I offer the following classes either at your venue or at my studio. For more information or to schedule a class, please CONTACT ME. Learn the art of piecing free form curves without pinning, marking or clipping. Add interest by incorporating multi-directional and 3 dimensional elements. Create your own lace and learn to insert it into your quilt. Embellish your work with yarns and threads of different weights. Finish off your piece using a clean and elegant facing technique. You will piece, quilt, embellish and face your quilt in class. Size of finished work is approximately 20” x 20”. 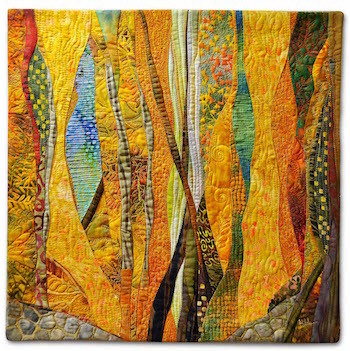 Inspired by a photograph, sketch or mental image, create your own abstract or representational forest scene using free-form and curve-piecing techniques. Study light and shadows and achieve depth by playing with shapes and color gradations. This class builds upon my beginners CURVES AND MORE class, taking the curved piecing to the next level where we create multiple curved sections and join them into one coherent piece, your own forest. Design and create your own village. 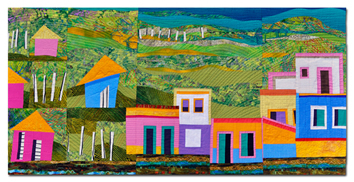 Learn improvisational piecing techniques to create huts, houses and curved landscapes. 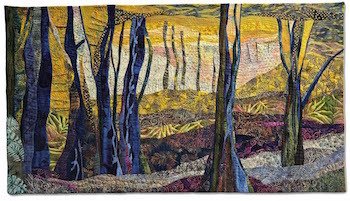 Learn to put it all together into a free form landscape quilt. 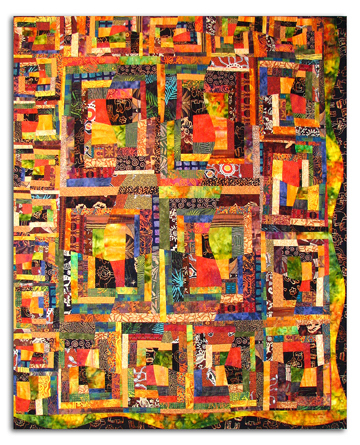 You will exercise strip and curved piecing techniques to create individual quilt units; design your own quilt diagram and put it all together through improvisational piecing techniques. Size of finished class work varies, I recommend 36”x36” or 40”x20” or 20”x40” approximately. Collect the essence of a favorite place based on your own impressions. 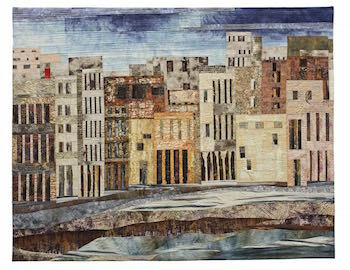 Design and create your own vision of a town, neighborhood, village, cityscape or skyline … detect common visual elements, highlight details, create building blocks and put them all together using improvisational piecing techniques. Add character to your town by experimenting with different surface design techniques (add texture, discharge color, incorporate 3D elements). Consider creating an irregularly shaped piece and finish off your work with an elegant facing technique. Recommended size of work is 36” or less on each side. Based on a traditional pattern, the log cabin, you will create this contemporary-looking quilt by bending the rules of this well known block. Once you have created several of these “untraditional” log cabin blocks you will be challenged to cut through them to achieve some very interesting and abstract designs. Bubbles included! Skills covered in this class include straight and curve machine piecing. 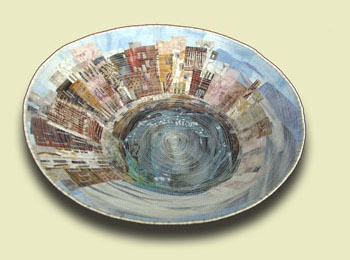 Create a three dimensional art piece in the shape of a bowl. Starting with heavy duck canvas, you will shape a bowl and then decorate with your own design and embellishments. Size of finished bowl is approximately 16” diameter.